The wind died down a bit in Key West today so we took the opportunity to leave the southernmost key and drive back up to Miami. Following our departure from the Southernmost Point Hotel who was kind enough to host us for two nights in their lush rooms with beautiful views, we made our way to Alan's house to get Xof1 and the trailor. After saying our goodbye's to Alan, we stopped by the Doubletree Hotel to take a few photos and hopefully land a sponsorship. Even without the sponsorship we lucked out because their General Manager donated a few dozen awesome doubletree chocolate chip cookies to the tour. Score!! So we were on the road again and making our way to the 7-mile bridge where TJ, who worked with a local utility company, agreed to drive us over the bridge to film the car while in the bed of his truck. We stopped for a few minutes before the bridge and Marcelo had a chance to cool off in the ocean. Then Josh jumped in the bed of TJ's truck but not without getting soaking wet. I find it strange that the car brings the rain with it where ever it goes. Not particularly good for us because we rely on the sun, but we deal with what we get. Our final day in the Keys was as beautiful as ever. 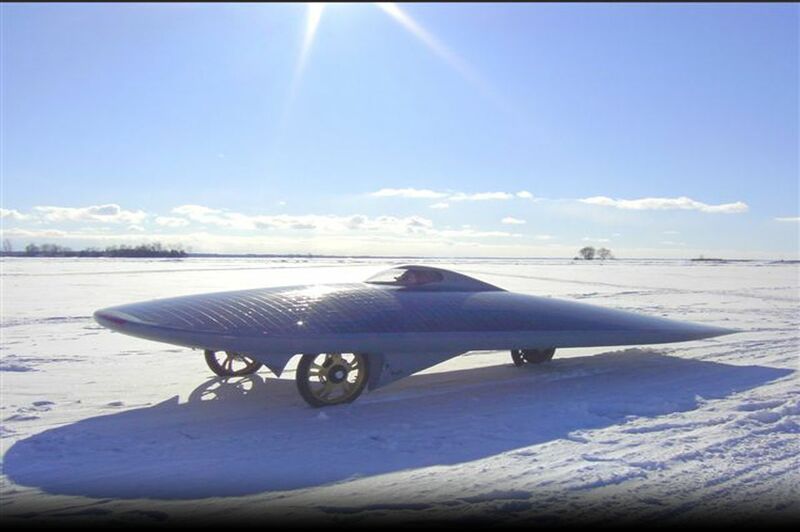 We prepared the solar car for it’s first journey northbound at the turning point following a countrywide southern descent. We had breakfast at Alan’s, and he gave us a huge road atlas to help us navigate the country. With Michael having to leave in Miami, Jamie, Valerio and I, will have to take the wheel. The Doubletree hotel, having heard about the illustrious solar tour, offered to give us support and an endorsement as we traveled. A man who met us outside Alan’s house apparently worked at Doubletree, and made sure that they supported the XOF1. The Doubletree Hotel donated about 50 chocolate chip walnut cookies! These will last for quite some time, I can already tell. On the road again!!!!! Jamie drove us out of the Keys, and we got to see the gorgeous beaches, islands, boats and sandbars while driving across the narrow bridges in the Florida Keys. We stopped briefly for a swim and photo op in the sunny beaches. We met up with TJ, who worked for the local utility company. Michael and I jumped in the back of his pickup truck to get some shots from the front of the solar car. Despite heavy rain, the bed of the pickup truck kept us and our cameras dry due to our momentum. We got a great picture of the XOF1 with a solar tree at the Florida Key’s local utility company. Karen and Ike, from our first pass through Key Largo, took us in their home for some lasagna, and great conversations. After our last bite of Key Lime Pie in the Florida Keys, I took the wheel of the van for the first time. It was a nice and easy ride back to Miami, and it was nice to finally get to drive the support vehicle. Once again, Audrey had some friends over for a party. I cooked steak and marinated chicken on the grill, and Valerio helped with preparing the corn. Audrey is a wonderful host, and it was so great to see her again on our Florida trek! Leaving the Southernmost Point Hotel. Alan, Xof1's generous host in the Keys. Jamie. Probably smiling at one of Marcelo's many jokes. Josh communicating with Marcelo via walkie talkie. Valerio giving Josh a break and filming. Our stop at the Double Tree Hotel in the Keys. Driving down A1A in the Keys. What a beautiful ride. A quick stop before the 7-mile bridge for a dip in the ocean. Trying to race the rain..
iFinally we leave the brigde but not without being pulled over. We were pretty used to it at this point. pie were amazing. Thank you Karen and Ike!